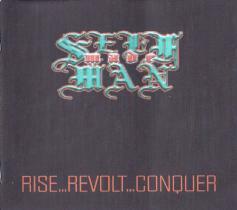 From 2004 - 2007 the band known as SELF MADE MAN ignited the unsigned Scottish metal scene. Playing gigs across the country From Aberdeen to Glasgow to Dundee to Fife & Angus, their unique style of nuclear powered political thrash metal terrorized and capitavated audiences throughout the country. After a number of line up changes & 2 EP's that have been recently remastered in the form of an album (currently available) the band have parted ways.